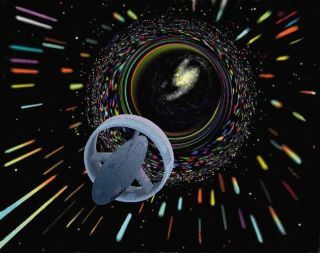 An artist's interpretation of utilizing a wormhole to travel through space, Thorne kick-started a serious discussion among scientists about whether or wormhole travel is possible. Donald Goldsmith is a freelance science writer and co-author (with Neil deGrasse Tyson) of "Origins: Fourteen Billion Years of Cosmic Evolution." Goldsmith contributed this article to Space.com's Expert Voices: Op-Ed & Insights. Imagine a time when humans, having spent decades exploring the solar system through landings on Venus and Mars; passages by the largest asteroids; close-up surveys of Jupiter and its giant moons; repeated loops through Saturn's system of rings and satellites; detailed photography of Uranus, Neptune and Pluto; and even landing on a comet, finally create a coherent plan to travel through interstellar space to reach the nearest stars and their planets. That time has almost arrived. Once NASA's Dawn spacecraft arrives at the asteroid Ceres in March of this year , and the space agency's New Horizons spacecraft flies by Pluto in July, humans will have completed the solar system exploration described above. They will have done so, of course, by creating complex and highly capable spacecraft that not only secure high-resolution images of the objects they encounter, but also roll across planetary surfaces to measure local conditions in a dozen different ways, including spectroscopic and chemical analysis of the composition and history of each object. Will humans ever replace robotic explorers? To many of us, the success of our automated spacecraft heralds the long-awaited moments when humans finally land on Mars, Ganymede (Jupiter's largest moon) or Titan (Saturn's largest moon), eventually to establish self-sustaining colonies that might provide a continuing opportunity to maintain our existence if our home planet were to become uninhabitable. The interplay between our logical wishes to deepen our knowledge of the solar system and our gut-level desires for personal encounters with new situations — always present though not always acknowledged — has governed humans' ever-shifting plans to explore our nearby cosmic environment for half a century. Some facts remain evident: Human exploration of space is dangerous and expensive, requiring the provision of food and water, recycling of wastes, significant amounts of energy to run those systems, protection against harsh radiation and a return journey (or not, depending on volunteers' propensities). In comparison, automated spacecraft have only modest energy requirements, and can last for decades or more. As time passes, this comparison progressively favors machines, since they (thanks to humans!) become ever more competent, while our bodies evolve at a much slower pace. As the brilliant physicist Freeman Dyson explains in the new podcast available at RawScience.tv, "Instruments have gotten enormously … humans are really out of it. If you want to go to space, that's for fun, not for science … This is not understood by the people in charge [of planning for future exploration missions]." To be sure, when we dream of the far future, we can easily envision (thanks, in part, to many science-fiction stories and films) beings that combine today's human bodies with advanced technology to produce a human-machine hybrid far more capable of long journeys and survival in strange situations than individuals are today. Dyson's argument in favor of machines counts for little among those who insist — who know — that our destiny lies in the presence of humans, not our mechanistic surrogates, in space. For many of us, this knowledge runs more deeply than argument can reach. A glance at the history of the United States' space program reminds us of the many times, during the 40-plus years since the last lunar landing, that NASA has attempted to produce a reasonable plan to send humans beyond low-Earth orbit — only to have the expense of such projects, combined with the lack of a clear focus for astronaut activity, lead to their abandonment. Because the manned lunar program basically served as a counterpunch to Soviet efforts in space, once NASA and the United States achieved their initial goal of landing on the moon, they proved unable of following a coherent plan for future space exploration by humans. On the fast track, or slow and steady? But how can we hope to move through space at close to the speed of light? More than 50 years ago, Dyson — who, even then, created intriguing and controversial ideas at the Institute for Advanced Study in Princeton, New Jersey — proposed that nuclear explosions could accelerate a spacecraft to ever-higher speeds. The "Project Orion" study, directed by Ted Taylor, though largely Dyson's brainchild, envisioned that a series of nuclear explosions would strike a "pusher plate" attached to the rear of a spacecraft, eventually accelerating the spacecraft to any desired velocity. The concept remains theoretically feasible, though one can easily see that the expense would be enormous. As Dyson recalls in the RawScience podcast, by using the power of nuclear explosions, the Orion spacecraft could provide "both fast acceleration and fast travel, which nothing else could do … In principle, the idea was good," Dyson said, but "it had one fatal flaw: The bombs are highly radioactive … As soon as you had the test-ban treaty … Orion was dead." When the spacecraft encounters dust and pebbles, the objects' near-light velocities, relative to the craft, enormously elevate their effective masses. An impactor's increase in mass, together with the tremendous collision speeds, call for enormous amounts of shielding to protect anyone inside the spacecraft. Hence, any plans to travel through the Milky Way at near-light speeds must embrace not only a truly massive propulsion system, but also enough shielding to protect the humans inside the craft. Nevertheless, Dyson's Orion concept remains, in many ways, the gold standard for visions of interstellar travel. In the recent podcast, Dyson noted that the name "Orion" has been passed on to NASA's most recent spacecraft design not for an interstellar vehicle, but for a far more modest craft to take astronauts to other worlds in the solar system. Dyson also identified the most basic requirement for interstellar spaceflight: a society capable of long-term planning and execution. "If you want to have a program for moving out into the universe, you have to think in centuries, not in decades." That necessity for a long-term vision poses a serious barrier to interstellar journeys in a society that has great difficulty planning for even the next five years. If we are prepared to think in centuries, as Dyson recommends, we should ask the key technological question: What prospects exist for interstellar space travel at comparatively low velocities? In the decades since this question first seriously arose, theorists have provided plenty of answers, which build on the success of our current interplanetary space probes. If you want to probe deeply into them, the coordinated websites of the Tau Zero Foundation and Centauri Dreams offer useful information on this topic. And if you want to examine a representative plan for interstellar travel, I recommend the PowerPoint presentation created by Steve Kilston, an astronomer who spent much of his career at Ball Aerospace (and with whom I have been friends since our undergraduate days). Kilston's "Plausible Path to the Stars" envisions the creation — in approximately 500 years — of a cylindrical spaceship that will carry a million inhabitants, will rotate in order to simulate Earth's gravity, will travel at 0.2 percent of the speed of light, and could reach the few dozen nearest stars in 10,000 years' time. In other words, Kilston's "Plausible Path," like any other low-velocity journey, requires that generations upon generations of spacefarers pass their entire lives short of their goal. Today, this plan would attract few volunteers. But if human society came to feel sure of its long-term viability, so that our time horizon stretched beyond the current limits of (at most) our grandchildren's lifetimes, the situation would become quite different. Perhaps the wisest aspect of Kilston's plan lies in its final prelaunch phase: a 100-year cruise through the solar system to demonstrate the full feasibility of the spacecraft and the willingness of its crew to pass their lives in space. Thus, a practical, technologically reasonable plan to explore our cosmic environment rests simply upon achieving a society in which a 100-year journey, and a few thousand years of travel time, seem both logical and desirable. To see how far we now stand from this goal, we may merely compare a film based on Kilston's "Plausible Path" with a movie like "Avatar" or "Interstellar." In today's world, almost no one is interested in moving from a situation in which months of spacecraft travel is far too long to one that tolerates multi-thousand-year journeys. Instead, we must hope for a better tomorrow. If we don't want to wait, what about taking the "Interstellar" route and using a wormhole to pass near-instantaneously from here to there? Kip Thorne, a physicist at the California Institute of Technology who's an expert on the subject — and whose screenplay inspired "Interstellar" — has written a book to accompany the film: "The Science of Interstellar" (W.W. Norton and Company, 2014). In the book, Thorne demonstrates that humans cannot rule out wormhole travel, but there is no guarantee that this method actually works, or that it could allow safe conduct through the voids of space. Physicists have recently suggested that the Milky Way could contain — or even be! — a giant wormhole. On the other hand, an argument against wormhole travel, or at least against its easy operation, lies in the fact that no creatures of a more advanced civilization appear to be popping out of wormholes in our solar system. A similar argument can be made against time travel, at least in the backward direction, since we have yet to encounter beings from the future who have decided to visit our present. To be frank, concepts of interstellar travel have progressed only modestly since Dyson envisioned the Orion project decades ago. Yes, layers of refinement have been added: "Slow" versus "fast" spaceflight has been debated and scored, experience has now given some indications of how well humans can survive long periods in space, and theoretical physics has provided some tantalizing possibilities that might make such journeys much easier than they now appear. But the big picture has not changed: First, we must figure out how to live successfully for the long term on Earth, and then we can go to the stars.